Oatmeal is one of the most heart-healthy breakfast foods in the American diet. It's soluble fiber helps to improve digestion, control your blood pressure, and lower cholesterol while keeping you full all morning. It can also help you control your weight. Oatmeal is also a great vehicle for healthy and tasty toppings like fruit, nuts, and spices; however, it's not often enjoyed with savory toppings. Savory oatmeal is a way to pack protein and veggies into your morning meal while keeping sugar in check. 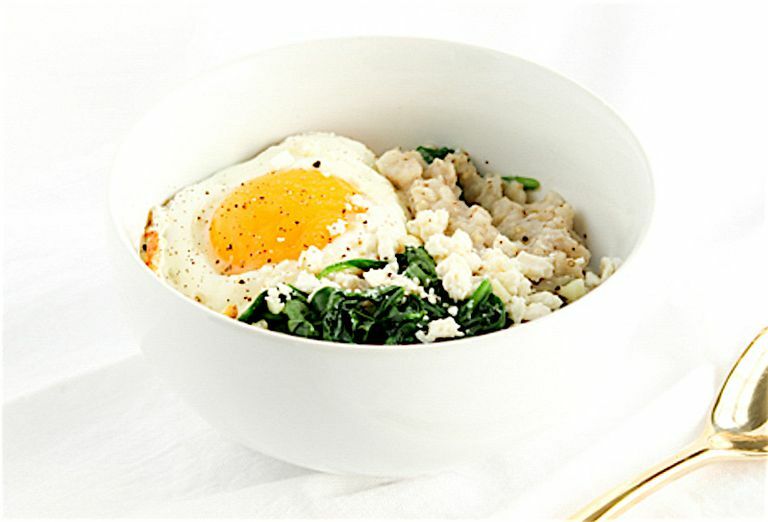 This spinach and feta oatmeal bowl 19 gram of high-quality protein, 5 grams of fiber, and a full serving of vegetables. It's one way to start your morning if you aren't a fan of sweet breakfasts. Since cheese is usually high in sodium, make sure to keep the portion at one tablespoon and to buy low-sodium broth to keep this bowl of oatmeal blood pressure-friendly. In a small saucepan, bring stock or water to a boil. Add oats and turn heat to low. Cook, stirring occasionally, until oats have absorbed all of the liquid, about 5 minutes. Meanwhile, in a small nonstick skillet, sauté garlic and spinach. Remove from pan and set aside. Spray skillet with olive oil spray and fry egg to desired doneness. Spoon oatmeal into a bowl. Stir in spinach and feta cheese. Top with fried egg and a generous crack of black pepper. Enjoy! You can substitute steel cut oats or quick-cooking oats depending on how much time you have. Adjust the amount of broth based on package directions. Just don’t use instant oats, as they typically have added sodium. Use any vegetables you have on hand, such as bell peppers, mushrooms, or onions. Round out this meal with a serving of fruit or enjoy alongside a non-sweetened beverage, like hot green tea.